Born into the hospitality industry, having grown up in her parent’s family-run hotel in Austria, Sandra Bein was initially reluctant to continue working in the business. Won over by a visit to a local catering college, however, she bowed to the inevitable and chose to pursue a career in food and drink. After graduating, she worked in various four-star hotels in Tyrol, Austria’s alpine state. Inspired by one of the restaurant managers, she began studying to become a sommelier, and her passion for wine was born. 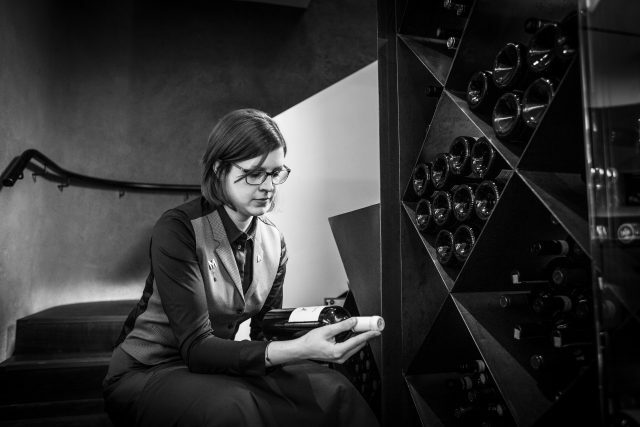 Consequently, the wine list at Mere is organised by grape variety rather than region, “from good-value, easy-drinking wines to classic appellations such as Sancerre and Châteuneuf-du-Pape, to indigenous Rotgipfler and Negroamaro”, she says. Alongside the Old World classics are a strong selection from New Zealand via the likes of a zippy, lime-laced Wild Earth Riesling 2016 from Central Otago and a Chenin Blanc from Gisborne’s Millton Vineyards. The restaurant also has its own grand cru Champagne, called Mere sur Mesure from Duval Leroy. Bein lists the blanc de blancs sparkler for £65 a bottle. Crafted by Bein, alongside David Galetti, the restaurant has an impressive two-page reserve list including the likes of R.D. Bollinger, Coche-Dury, and ready-to-go first growths. It is also noted for its by-the-glass offering, with Coravin enabling around 50 wines to be sampled in smaller measures. Bein’s influence can also be seen in the number of Austrian wines that grace the list, from a Chardonnay from Markus Huber, Weingut Prieler’s Pinot Blanc Seeberg and Sankt Laurent from Johanneshof Reinisch.